"Sexson" redirects here. For the Freemason Reverend Mark Sexson, see International Order of the Rainbow for Girls. 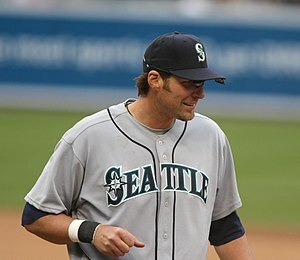 Sexson with the Mariners in 2008. Richmond Lockwood Sexson (born December 29, 1974) is a former Major League Baseball first baseman who played for five teams from 1997 to 2008. Sexson was born in Portland, Oregon. At Prairie High School in Brush Prairie, Washington, Sexson was an All-State performer in baseball, basketball, and football. He also set the school record for the most RBI and home runs in a career. Sexson was drafted in 1993 by the Cleveland Indians in the 24th round (671st overall) of the baseball amateur draft. He reached the major leagues with five games in 1997. Sexson had a breakout year in 1999 with 31 home runs, and 116 runs batted in in 134 games. In 2000, Sexson was traded to the Milwaukee Brewers with a player to be named later, for Bob Wickman, Steve Woodard, and Jason Bere. In 2001, his 45 home runs tied the Brewers record set by Gorman Thomas in 1979. His 178 strikeouts also broke the Brewers record, but this was surpassed the following season by José Hernández. In 2002, Sexson represented the Milwaukee Brewers in the MLB All-Star Game which was played in Milwaukee. In 2003, he played in all 162 games and again tied the Brewers record of 45 home runs while hitting .272 and earning a selection to the 2003 MLB All-Star Game. Prince Fielder broke Sexson's and Thomas's team record in 2007, hitting 50 home runs. As a Brewer Sexson was the only player to hit a ball off the flag pole at Minute Maid Park. Sexson tripled off it with no outs, but wasn't hit in. Sexson was traded to the Arizona Diamondbacks in December 2003 along with pitcher Shane Nance and a player to be named later (Noochie Varner) for infielders Junior Spivey, Craig Counsell, Lyle Overbay, catcher Chad Moeller, and pitchers Chris Capuano and Jorge de la Rosa. This trade proved to be disastrous for the Diamondbacks, as Sexson missed most of the 2004 season after twice suffering a reverse subluxation of his left shoulder while attempting to check his swing. Richie Sexson at bat, May 2005. On May 8, 2008, in a game against the Texas Rangers, Sexson charged the mound towards Rangers starting pitcher Kason Gabbard and threw his batting helmet at him after Gabbard threw a head-high pitch over the middle of the plate, to which Sexson reacted as if it had hit him. Sexson later stated he was frustrated and had a lot going on in his head, including his son being in the hospital and his club's recent struggles. He was suspended six games for the incident. He later appealed the suspension, and it was dropped to five games. Sexson recently lived in Ridgefield, Washington with his wife Kerry. Since 2014, he has been a baseball coach at Summit High School in Bend, Oregon. Wikimedia Commons has media related to Richie Sexson. ^ "Sports: Brewers Notebook: Rogers, Kintzler overcome steep odds". Onmilwaukee.com. September 13, 2010. Retrieved September 20, 2010. ^ "Yankees sign first baseman Richie Sexson". MLB.com. Retrieved August 10, 2008. ^ "Yanks demote Melky, cut Sexson". Retrieved March 28, 2019. ^ "Summit High School athletics page". This page was last edited on 16 April 2019, at 03:51 (UTC).